For many people, a Seattle vacation itinerary includes Vancouver BC. Or a Vancouver trip includes time in Seattle. But what about having some fun on the route in between? The northwest section of Washington State offers many fabulous sights, foods, and attractions. 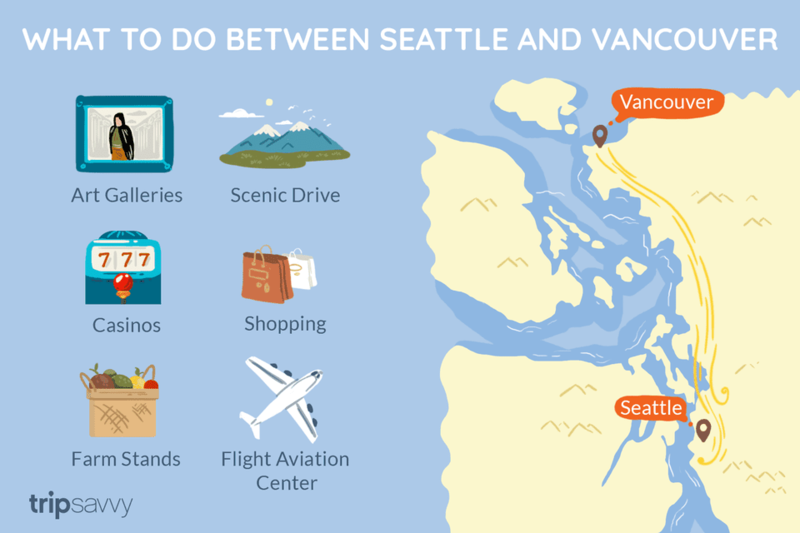 Here are my recommendations for fun things to do on the road between Seattle and Vancouver BC. Two of Washington's best art communities are found along the road between Seattle and Vancouver. LaConner, in Skagit Valley, offers the opportunity to stroll along the waterfront while checking out art galleries and shops. The Wood Merchant, Earthenworks Gallery, and Two Moons Gallery & Gifts all have wonderful selections of original art, fine crafts, home furnishings, and gift items. Farther north along I-5 is the historic district of Fairhaven. Fairhaven, located just south of downtown Bellingham, has many locally-owned shops and galleries; you'll find a great selection of affordable and unique items. My favorite Fairhaven galleries include Gallery West, Artwood, and Renaissance Celebration. Interstate-5 is the most direct route between Seattle and Vancouver BC and offers lovely scenery. Take a detour off of I-5 and you'll experience some of the best scenery in the region, both majestic and pastoral. The shortest and easiest scenic drive to incorporate into your journey is Chuckanut Drive, which runs through farmland and along the Puget Sound between the towns of Bow and Bellingham. Scenic drives that can take you off of the Interstate for a few hours or more include the Mt. Baker Highway, Semiahmoo Spit, and the North Cascades Scenic Highway. The region north of Seattle contains some of the lushest and most productive farmland in the world. Gorgeous fresh produce can be found in farm stands and markets throughout Skagit and Whatcom counties. Depending on the time of year, you'll find berries, hazelnuts, cheeses and dairy products, cider, apples, and more. Wineries abound, many with tasting rooms. Local oyster and shellfish farms provide their wonderful products to markets and restaurants in the area - oyster lovers will want to stop at one or more of the eateries located along Chuckanut Drive. Whether it's radios or airplanes, if you're fascinated by how things work, you'll love the museums and visitor centers found along the route between Seattle and Vancouver BC. Located near Boeing's humongous Everett manufacturing plant is the Future of Flight Aviation Center, where you can learn about designing and building aircraft through interactive exhibits and by taking the Boeing Tour. Aviation enthusiasts will want to check out the historic airplanes at The Flying Heritage Collection, also located at Everett's Paine Field. Downtown Bellingham is the home of the SPARK Museum of Electrical Invention. Science buffs will delight in this museum's collection of historically-significant experimental apparatus. The casinos in Washington State offer Vegas-style gaming along with good food, live entertainment, and other amenities. Tulalip Resort Casino, located next to the Seattle Premium Outlets at I-5 exit #202, is a full-service resort destination, with upscale lodging and dining, meeting facilities, and a spa. Skagit Valley Casino Resort in the town of Bow is another place where you can enjoy gambling, lodging, and live entertainment at one destination. Other casinos located along the route between Vancouver BC and Seattle are the Silver Reef Casino in Ferndale and Angel of the Winds in Arlington. There are two major outlet shopping malls located along Interstate 5 between Seattle and Vancouver BC. Seattle Premium Outlets, located in Tulalip at exit #202, offers shops from a number of high-end retailers such as Kate Spade, Ann Taylor, Ralph Lauren, and Coach. This outlet mall has nicely landscaped grounds and is home to several fast food and snack shops. Farther north (exit #229) you'll find The Outlet Shoppes at Burlington. There you'll find bargain shopping opportunities at such retailers as Jones New York, Pendleton, Corningware, and Carter's Childrenswear.